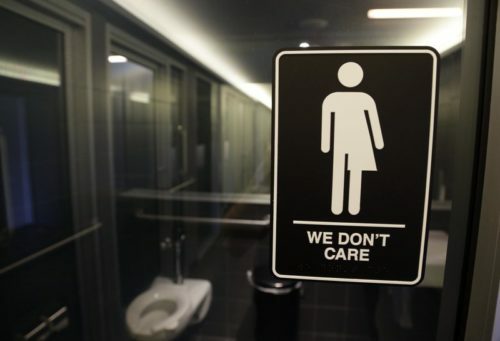 A federal court has declared that House Bill 142, the law that replaced North Carolina’s discriminatory House Bill 2, doesn’t bar transgender people from using public facilities – including restrooms. This effectively returned North Carolina to pre-HB2 days as far as trans restroom use is concerned. Transgender people in the state may use restrooms that match their self-identity, not based on, for example, their birth certificate. The ACLU and Lambda Legal represent the six plaintiffs in the case. “I am relieved to finally have the court unequivocally say that there is no law in North Carolina that can be used to bar transgender people from using restrooms that match who we are,” said Joaquin Carcaño, lead plaintiff in the lawsuit, said. “In light of this ruling, there should no longer be any excuse for discrimination in government facilities against transgender students and employees, who are simply trying to get through daily life like everyone else,” said Lambda Legal Counsel Tara Borelli. HB 142 was enacted to replace North Carolina’s widely unpopular HB2. That bill led to discrimination against LGBTQ North Carolinians and caused businesses and events to boycott the state. It also led to the downfall of former North Carolina Governor, Pat McCrory. It was McCrory’s predecessor, Roy Cooper, who signed HB 142. The Governor also said last year that HB 142 should not bar restroom access, but the vagueness of the law’s language led to uncertainty in the state, and effectively continued HB2’s stance towards restroom access. Now the courts have sided with the Governor as well as the plaintiffs. The ruling also allowed a further challenge on HB 142 to go forward. The plaintiffs are still seeking to overturn a provision in the law that ban’s local LGBTQ non-discrimination policies. That prohibition is in place until 2020.